Ten Miles Past Normal by Frances O'Roarke Dowell. (Grades 7-10.) Atheneum, March 2011. 211 pages. Reviewed from ARC provided by publisher. Goat poop. This is the only reason people know who Janie is at her high school: she's the girl who stepped in goat poop and stank up the whole school bus. And it's entirely her own fault because she's the one who suggested that the family move to a farm in the first place (she was only nine! Who takes a nine-year-old seriously?!). Janie didn't think that's how high school would be. She pictured herself surrounded by a group of close friends, laughing and flirting with cute boys, running for student council. Instead, she's eating lunch by herself in the library and trying to remain anonymous (it's that or be called Skunk Girl... urgh). As things slowly begin to change for Janie, will it mean hooking up with her major crush Jeremy Fitch? Will it mean losing her best friend Sarah? Will it mean having to sing at a hootenanny thrown by her farm-embracing blogger mom? Ten Miles Past Normal is a story about a girl embracing her originality, allowing herself to be weird, and navigating the tricky landscape of freshman year. Everything's so different from middle school and suddenly she's reevaluating everything. Sure it's pretty out on the farm, but why can't she live in a suburb like everyone else? Her best friend Sarah is her lifeline at school, but lately Sarah's been annoyingly controlling and fake... is it maybe time for Janie to branch out? And how does she do that, exactly? I loved the layers of the story. There's the farm thing, dealing with her best friend, making new friends, learning how to play the bass, a boy named Monster, an embarrassing blogger mom, and a research project on two octogenarian civil rights activists. Where it could have easily spun off into Too-Much-To-Handle Land, instead each layer enriched the story and made it a more complete and satisfying read. Teen girls venturing off into the unknowns of high school will identify with Janie's struggles. This is a story with many laughs, a good dose of quirkiness, and a whole lotta heart. 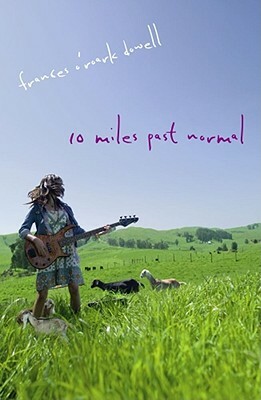 I'd recommend Ten Miles Past Normal to fans of Dairy Queen by Catherine Gilbert Murdock for teens who liked DJ Schwenk's determination to do something different with her life (even though she did not feel particularly special). I also think fans of Dowell's previous books The Secret Language of Girls and The Kind of Friends We Used To Be will dig this newest novel for its realistic depictions of high school life. Ten Miles Past Normal will be on shelves March 22. Author Extravaganza at the New Albany Library!